Rotisserie Thermocouple Valve Keeps Turning Off Burner – Explanation Repair and Use. Often customers contact us for assistance because a infrared rotisserie burner will turn on but then turns itself off when the control knob is released. 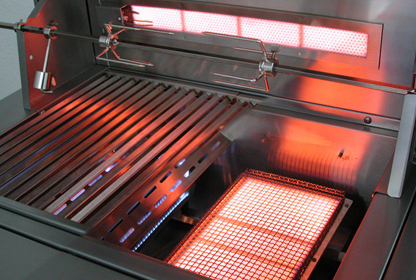 Rotisserie infrared back burners should keep burning until we turn them off! Usually when a client contacts us with this complaint the assumption is that the thermocouple is not functioning or the burner is damaged but about ninety nine percent of the time neither of these are problematic. The safety feature of the control has a spring loaded solenoid which can be easily damaged, even inside the body of the valve. What we are trying to demonstrate here is what and where and how this works but also how to “cheat” past this safety mechanism — but do not do this at home. This is more like a thought experiment or something a highly experienced, licensed (and insured) gas technician may consider but what we show here is meant as a thought experiment showing functionality and processes, not instructions to follow. The hood of a gas grill is designed so the hottest part of convectional heat takes the widest diameter circulation and flows out the back of the gap behind the grill hood. When wind is blowing off the ocean or across a lake or simply blowing in this direction it can easily hinder the ability for this hottest air circulation to escape. Over time our control valves will get sticky and will eventually “freeze”, or stop turning because over time the lubrication has been slowly damaged by this heat. The rotisserie valve solenoid is a lot more fragile. While the control valve sin this environment could take 7-10 years to “freeze” the rotisserie solenoid has a thin plastic housing around the copper coil and iron core and this is very easily warped by heat. Although not easy to see without un-assembling the rotisserie control valve, this solenoid is often exactly the reason the rotisserie turns the burner off when ever we remove our hand from holding down the control knob as shown in the repair video above. Next post: Replace Extinct Turbo Challenger and STS Control Valve in BBQ Galore Barbecue Model.